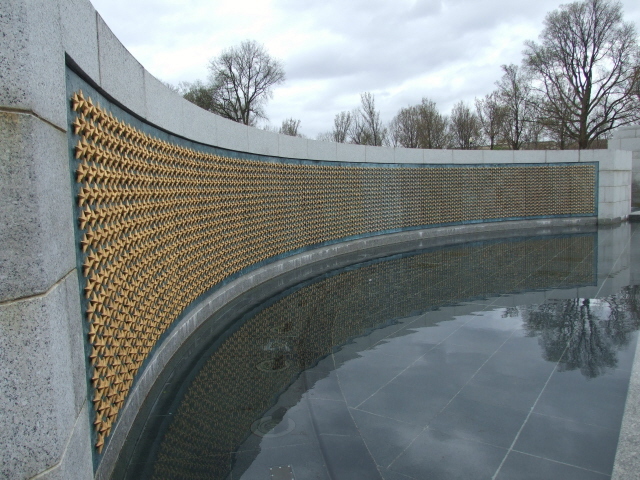 The famous memorial wall on the National Mall in downtown Washington D.C., USA – regarded as one of the world's most significant and most moving war memorials. It's part of a whole cluster of memorials on the Mall but certainly the premier one, not only from a dark tourism perspective. 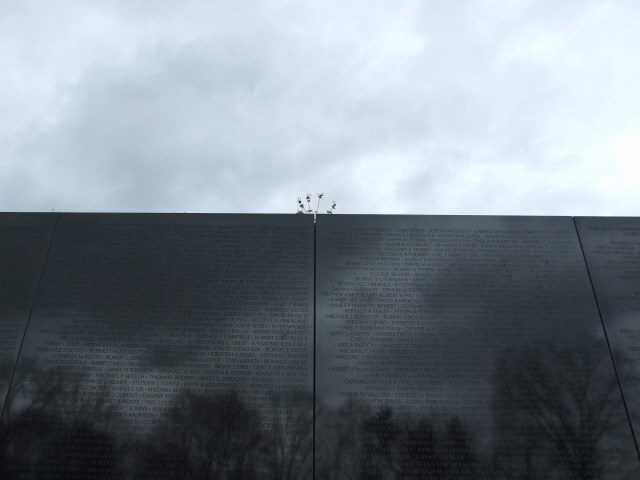 More background info: This memorial wall commemorating the Vietnam War was designed the young Chinese-American Maya Lin, who won the design competition in 1981 when she was an undergraduate art student and only 21 years of age. Her design was not instantly universally popular; in fact at first it caused some controversy. For some it was simply too "modern" – or just not traditional enough, lacking the usual hero worship. It was in order to appease such critics that a couple of years later the more traditional bronze sculpture of the "Three Servicemen" was added, as well as a flagpole – and 10 years later still, the supplement of the women's sculpture was added to the ensemble too. Furthermore there's a plaque for veterans who died as a consequence of the war after the war, but who were not "covered" by the Department of Defense. Still, the general public clearly seems to favour the main wall memorial – given the crowds there, whereas the other addenda are more frequently overlooked. 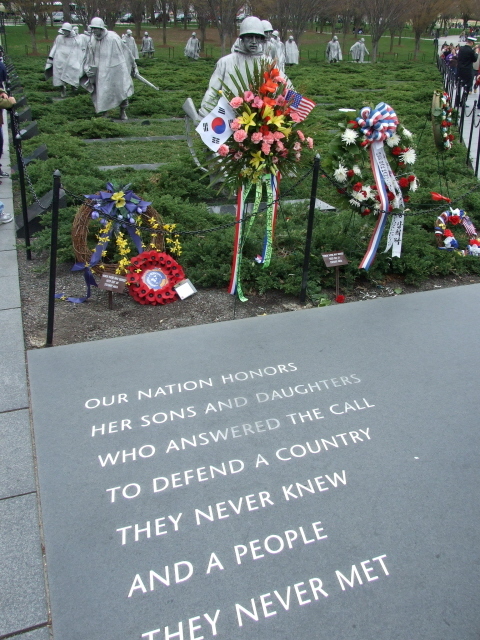 Around 3 million visitors come to see the Memorial Wall annually. This alone makes it one of the most significant dark tourism sites in the USA. The dark here, however, is rather abstract, more cause for reflection, not in any way grim and sinister in any graphic sense. In fact, I even encountered (in March 2010) an almost uplifting element – in the form of flowers sprouting from the top of the wall, roughly where it is at its highest (see photos). 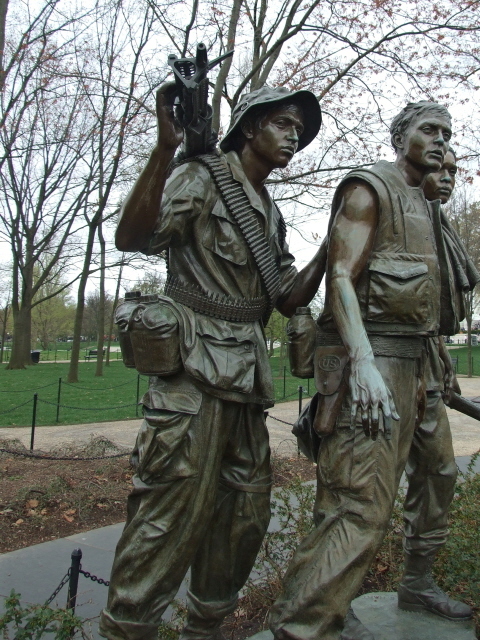 What there is to see: The Vietnam Veterans Memorial today actually consists of three separate memorials: the Three Servicemen group of statues, the Vietnam Women's Memorial and, most importantly and originally, the Vietnam Veterans Memorial Wall. 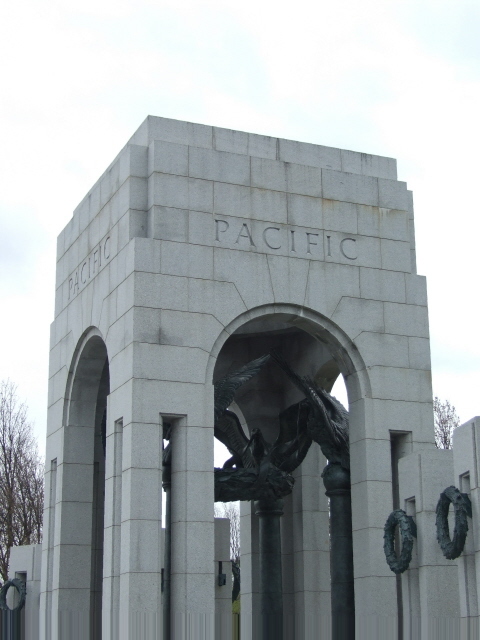 The latter is one of the world's most famous war memorials. 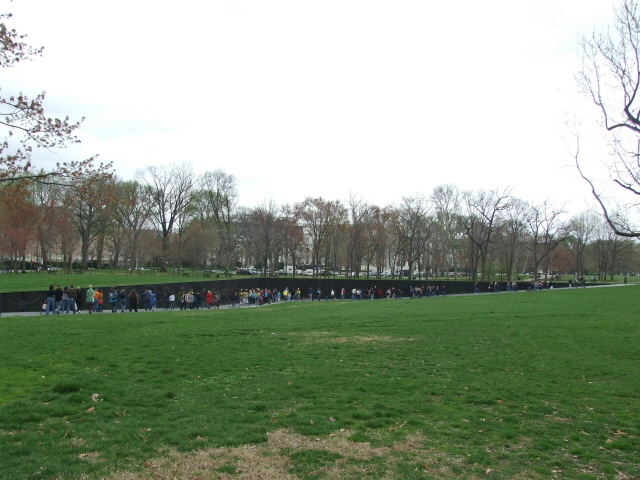 The Memorial Wall is made up of two sections of black granite set at an angle, it's at its highest in the middle where the two sections meet and gradually gets lower, as if sinking into the ground, towards the farthest ends. 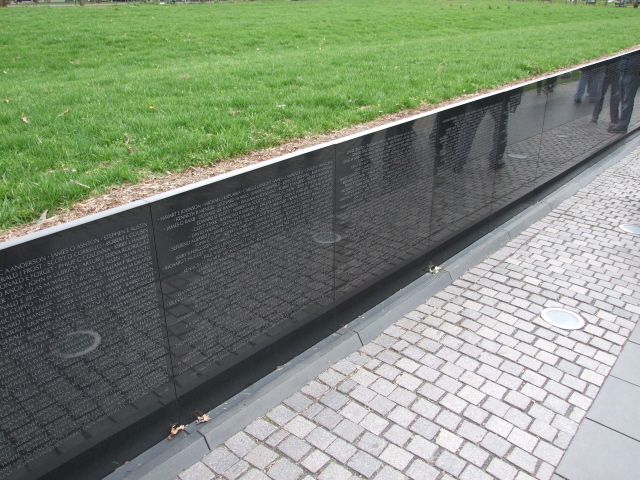 On the wall, the names of all known US servicemen (and a few servicewomen) who died in the Vietnam War, or are classed as "missing", are inscribed – nearly 60,000 in total. The number is not definitive, and additions can be made. The majority of names, however, are listed in chronological order by the date on which they were killed or went missing. 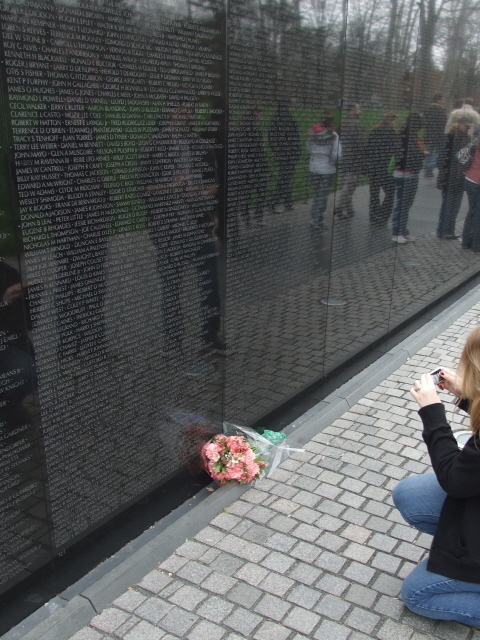 Because of the polished surface of the wall, people looking at it are reflected on the wall too – as are surrounding monuments of the National Mall. There's also a directory to facilitate the finding of specific names. You often see flowers, flags or other memorial items left by mourners (these are regularly collected, catalogued and put into storage) – and of course you can see the mourners themselves. 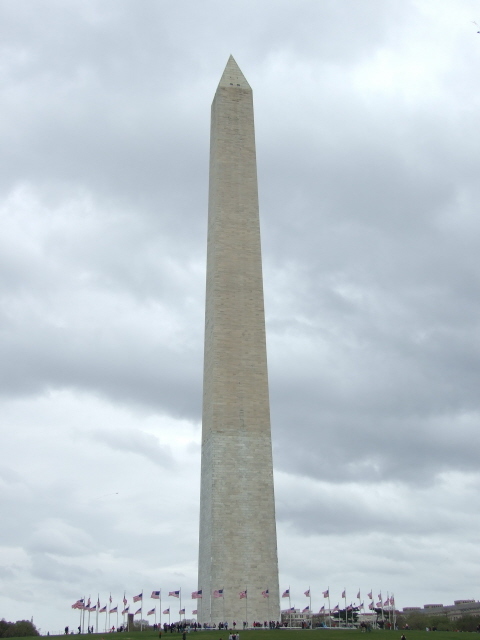 The monument is actually one of those that really serves its purpose in that sense, i.e. for people affected by the events it commemorates, who come to see the engraved names of friends or family members they lost in the conflict. 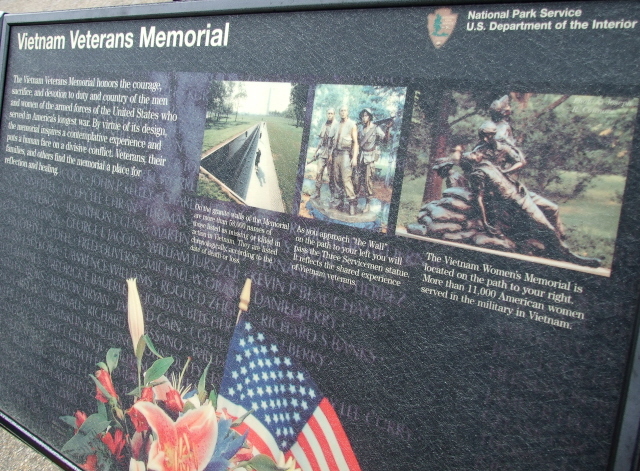 That is: it is also a memorial space for the Vietnam veterans who survived! 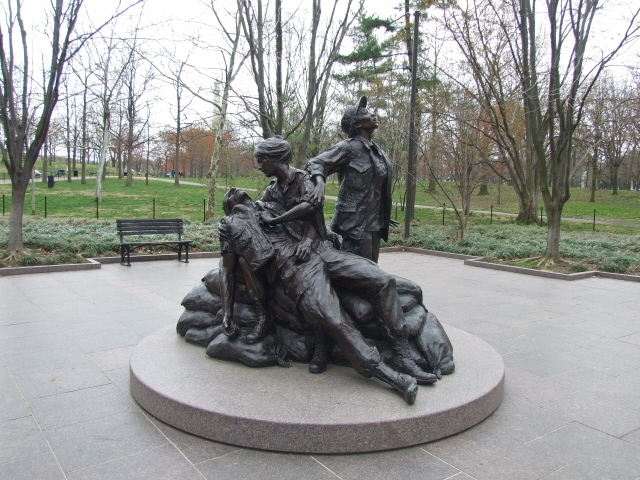 The women group sculpture was added to honour the over 11,000 women who served in Vietnam, mostly as medics. Thus one of the figures in the ensemble isn't a woman but a wounded male soldier attended to by one of the three women. Another one is looking up to the sky (supposedly symbolizing "hope") and another kneeling (allegedly symbolizing "faith"). It's all well intended but looks somewhat incongruously cheesy. A lower dose of kitsch would have befitted this monument better. All in all, it is the Wall that remains the centre of attention here, and justly so, even if its design is quiet abstract rather than in any way graphically dark. When at the Vietnam Veterans Memorial it makes perfect sense to go and see the other war memorials along the National Mall too … and to compare (see under combinations) – the contrasts between the different designs are quite striking. Location: in Constitution Gardens, in the north-western part of the National Mall just 300 yards north of the imposing Lincoln Memorial at the western end of the Reflecting Pool, in downtown Washington D.C., about a mile (1.5 km) from the White House and two miles (3.2 km) from the Capitol. Details: to get to the Vietnam Veterans Memorial it's best to incorporate a visit as part of a longer stroll around the eastern part of the National Mall. When starting from the east, you could get the Metro to the Smithsonian station (blue and orange lines) and walk past the Washington Monument towards the west (ca. one mile / 1.5 km); or you could tag it on after visiting Arlington National Cemetery, also about a mile and a bit away across the Potomac (crossed by Arlington Memorial Bridge). The nearest Metro station is Foggy Bottom (blue and orange lines) to the north, which is still ca. three-quarters of a mile (750m) away. In theory you could drive, but it's really not worth the hassle of city driving and looking for parking. Those who can't or don't want to walk so much could also fall back on the tourist shuttle "train"/bus called "Tourmobile", a hop-on, hop-off sightseeing operation that ticks off all the important points on the Mall and nearby, including Arlington (though it is not cheap – 27 USD for one day, better value at 35 USD for two days). 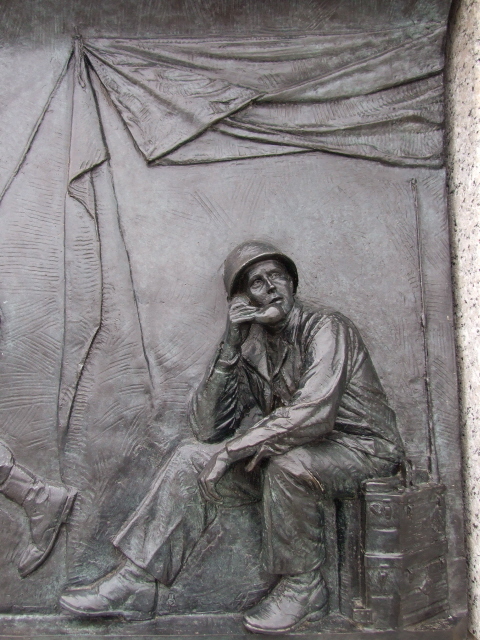 Times and admission: The memorial can be visited freely at any time. US National Park rangers are on duty (e.g. to answer questions or give directions) between 9:30 a.m. and 11:30 p.m. daily. Time required: not long for just a walk by for a look, maybe 20 minutes in all. 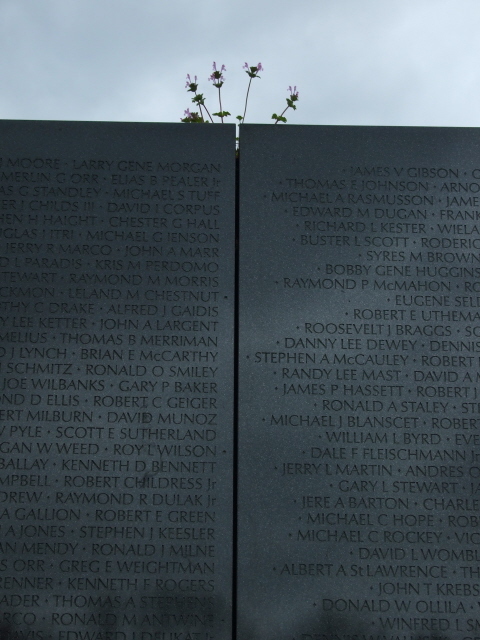 But of course you can spend much longer for contemplation and/or studying the countless names on the Memorial Wall. Add extra time for seeing the other nearby war memorials, though (see 'combinations' below). Combinations with other dark destinations: in the vicinity of the ensemble of the Vietnam Veterans Memorial are further war memorials that are well worth a look. 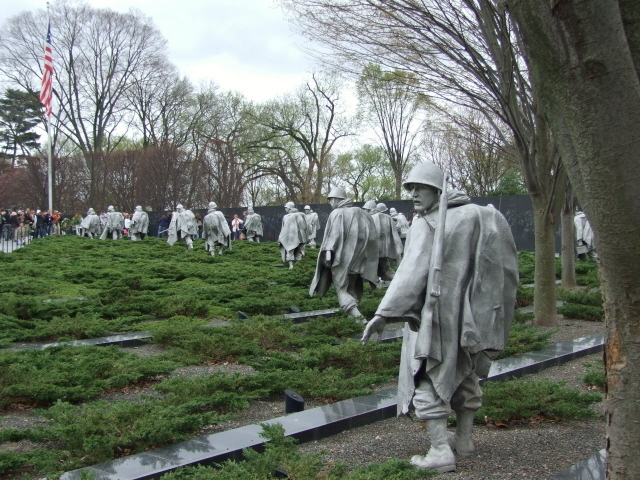 Nearest is the Korean War Memorial, just south of the Reflecting Pool. This is an altogether different design, dominated by a triangular central field, or rather combined wood and shrubbery, through which a set of 19 statues of soldiers are "marching" in long rain overcoats. These grey steel statues do look rather grim and sinister, some with almost scary hollow facial expressions! 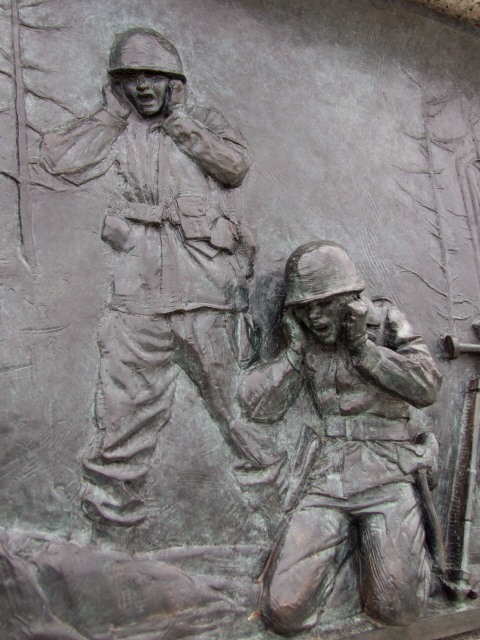 Behind the soldiers is another polished black granite wall (in which the figures of the soldiers are reflected). 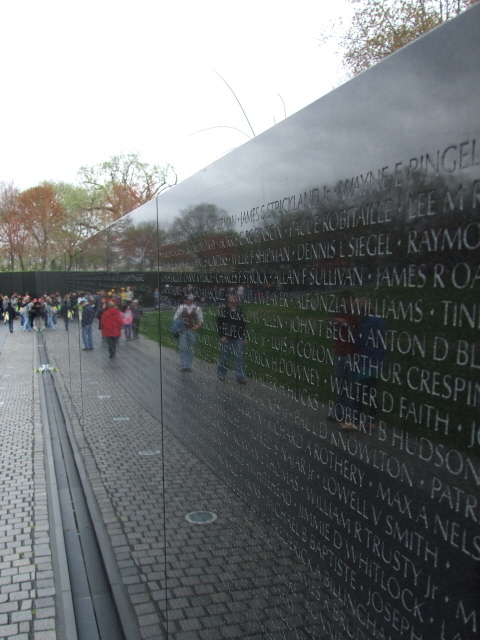 Unlike at the Vietnam War equivalent, this wall instead of names has photographic images etched onto it, depicting more grim images of soldiers but also plain realistic images of war equipment (planes etc.). At the front point of the triangle is a flag pole (stars and stripes yet again), an area for wreathes and more flags and a plaque set into the ground with the following words engraved into it: "Our nation honors her sons and daughters who answered the call to defend a country they never knew and a people they never met" – which I find a stunning and exceptional admission of ignorance and detachment! Wow! 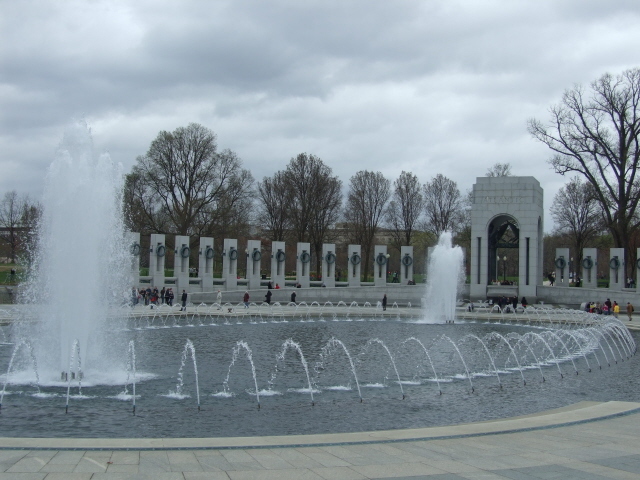 At the other, eastern end of the Reflecting Pool is the even more recently added WWII memorial. Now this is an oversized, overly "classic" design, and downright pompous affair. Temples dedicated to the European and the Pacific "theatres", respectively, flank the sides, and in between is a fountain feature ringed by walls with traditional bronze wreathes etc. 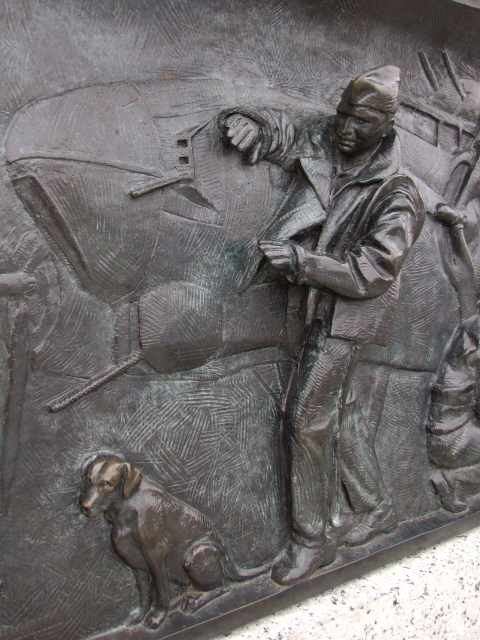 – and even bronze relief plates depicting scenes from war. Particular place names of famous battles are etched into the stone on the inside of the ring, and the names of the USA's states line the outside of the wall. It's rightly controversial – an ugly and disproportionate pile. Ghastly. The Lincoln Reflecting Pool – the main, long, rectangular one stretching westwards from here – and the Lincoln Memorial at its end are also worth mentioning for the site's partly dark-ish, but certainly momentous historic associations: it was here that Martin Luther King, who was later assassinated in Memphis, gave his famous "I have a dream …" speech from the steps of the Lincoln Memorial during the "March on Washington" demonstrations for racial equality in 1963. In 1969 it was the venue for the biggest anti-Vietnam-War rally, with ca. 100,000 protesters gathered around the reflecting pool. More recently, the Obama presidential inauguration party took place here in January 2009 (although that isn't dark in itself – but still worth mentioning because it ended the particularly dark era of the eight previous Bush years). 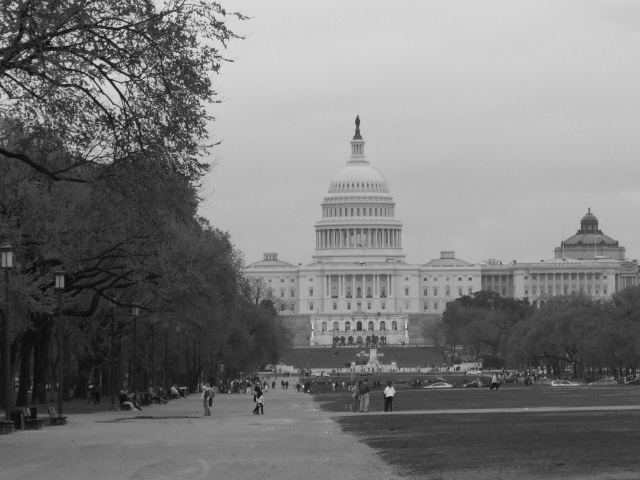 Other dark destinations in the vicinity that are described in more depth in their own entries on this website include: Arlington, the US Holocaust Museum and the Newseum. For more sites see under Washington D.C. 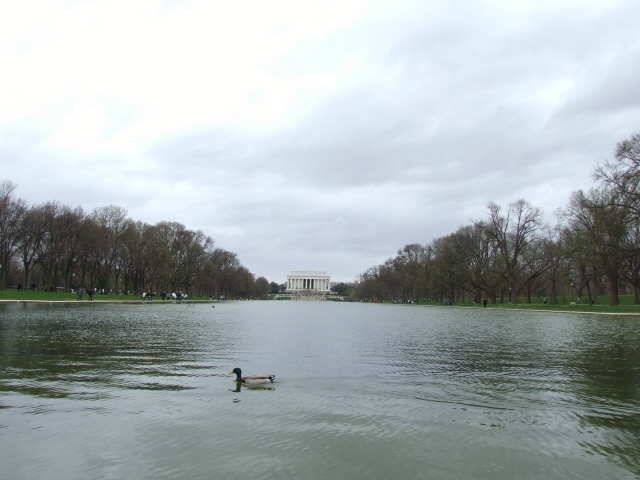 Combinations with non-dark destinations: the National Mall is the very heart of touristic Washington – lined up along it are also (west to east): the Lincoln Memorial (and more presidential memorials around it), the White House, the various Smithsonian museums, the tall obelisk of the Washington Monument and lastly at the eastern end the Capitol. Tourist sights could hardly come more concentrated. See under Washington D.C.for more info.